Flying Bear Farm (open by appointment only) is a 3/4 acre flower farm and full service floral design studio, owned and operated by the husband and wife team of Benjamin Courteau and Melissa Brown. We are nestled in the wooded hills on the edge of Langley, WA on South Whidbey Island, which is about an hour north of Seattle. Known as the “village by the sea” Langley is a thriving arts community and is a popular weekend destination. As of Labor Day Weekend, 2017, we have also created a sweet brick + mortar shop in downtown Langley called Flying Bear, which provides a direct connection between our flowers and customers all year long! We offer hand-grown flowers and rare produce to Whidbey Island weddings, special events, farmers markets and restaurants. We specialize in magical floral design services, steeped in a "new agrarian" aesthetic rooted deeply in the beauty of nature and working the land, that feature our heirloom botanical products. We strive to be as hyper-local as possible, sourcing what we cannot grow from other farmers we know and love! Our flower shop is located at 207 1st Street in Langley, WA. Flying Bear is a full-service flower shop and more. We supply our shop with seasonal flowers from our farm, as well as from other farms on Whidbey Island. We also source from the Seattle Wholesale Growers Market, a co-op of west coast flower farmers. In addition to flowers, our shop carries dozens of products sourced from makers in Cascadia and beyond. Everything from art, tea, candles and body products, to unique cards, wool blankets and ceramics. We hope to provide visitors with love-giving gifts for your loved ones or for yourself. Find our front entry on 1st Street in downtown Langley. We're between the Moonraker bookstore and the Star Store Mercantile. We also have a back entry from McCleod Alley that is easy to get to from the Star Store Grocery parking lot and 2nd Street. For pickup orders, feel free to park in the back. 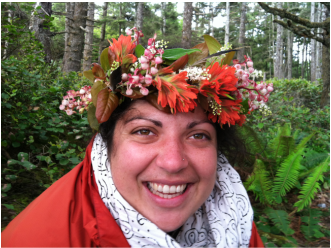 Melissa is a native of the Greenwood neighborhood in north Seattle where she found the love of dirt and art early in life...Finally, her two first loves have come together in her calling as a farmer florist! As the daughter of an artist mom and architect dad, art and creation were always available and encouraged in Melissa's life. Riding shotgun during her mother's stint at a flower shop, she became instantly inspired and absorbed as much as she could! Melissa's background in growing things started with her parents in the backyard and blossomed through internships at Seattle Tilth and Oxbow Farm and Education Center where she learned by teaching others, a BA from Antioch in Sustainable Urban Agriculture and Social Change, as well as working in Marigold and Mint's flower fields and taking classes from Seattle Wholesale Growers Market. Eventually, after engaging as much as she could in the urban agriculture landscape, the tickle of a life-long dream could no longer be ignored...it was time to go big(ish) and go rural! With her husband, Ben, she up and moved to Langley, WA to find a little space and dive even deeper into her connection to nature and an agrarian life. Melissa's aesthetic grows from the beauty she sees on her tiny farm, in the magical, wild woods, and at the ocean's edge. She is now lucky enough to be the lead designer and co-visionary/farmer/owner at Flying Bear Farm! Ben grew up in Colorado and Montana where farms, ranches and wilderness are a normal part of life. He has a diverse background with a BA in History and an MA in International Relations and has extensive management and marketing experience from administering university programs and events at the University of Montana. His understanding of history, global political economics and ecology helped him to realize that his true passion for cultivating a better world lay in an agrarian future for himself and his family. His gardening and farming background began at a young age, as his plant-loving family brought him up in a household where gardening and landscaping were normal weekend endeavors. Ben first applied his landscaping knowledge and farming techniques to community gardens during a graduate internship in East Jerusalem. In 2009 Ben enrolled as an intern at the University of Montana’s P.E.A.S Farm, an experiential bio-dynamic farm education program. There he learned skills necessary to be a successful organic farmer. He is continuing his education in flower farming, exuberantly learning as he goes. Moon was born in late February of 2015 on a dairy farm near Bellingham, WA. Her parents are working dogs, one a border collie, the other a catahoula leopard dog. The farmer worked with Happy Tails, Happy Homes, a rescue organization, to give moon and her 11 siblings up for adoption to loving and capable homes. We adopted her on May 1st of 2015, and she has earned her position as honorary CEO of Flying Bear Farm. She is also in charge of chasing off the bunnies. She loves to run. Everyone knows that border collies are extremely athletic dogs, but add in the catahoula and it takes that athleticism to a whole new level. 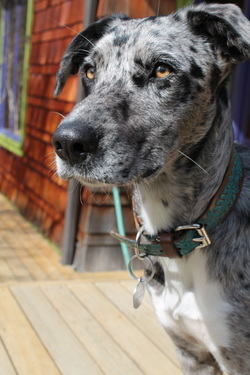 We didn't know anything about catahoulas before moon, but we've learned a great deal. They're the state dog of Louisiana, and were bred as a mix of a native american breed and a grey hound in the late 17th century primarily to hunt wild boar. In modern times, catahoulas have become a herding dog. Moon is fast, smart and fearless. She is also kind, loving and likes to snuggle.